World, meet the Lulzbot Mini. Mini, meet the crazy world you’ve been brought into. Don’t worry -- you’ll fit in just fine. There are many wonderful things about you that deserve recognition. I’ll be quick about this. It’s only a matter of time before the next 3D printer Kickstarts its way into existence. In such a dynamic market, it’s difficult to say two things about any one printer before it’s either updated our outdated. So, without further ado, here is my critique of the Mini (v1). Viget purchased a Mini a little over a month ago and we’ve been ecstatic with its performance. Out of the box, it just worked. How many things with moving parts can you say that about? Well, it took Lulzbot some effort to make it that way -- and, here’s why. Lulzbot Mini print bed-leveling routine. Metal washers above the print bed come into contact with the metal extruder nozzle as it probes the four corners of the print bed. When the washers and nozzle touch, an electrical contact is made and the height of a corner is established. The Mini repeats this process for each of the four corners of the print bed. When the bed-leveling routing is completed, an average height is calculated and, through the use of Gcode modifiers, the model is printed at an appropriate height without needing any physical adjustment. Curious about Gcode? Read this article. A level print bed results in strong part adhesion to the print bed. 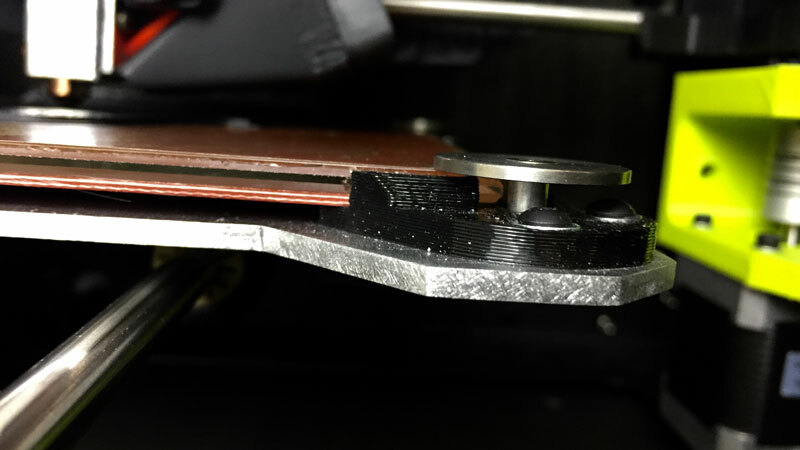 Thankfully, the Mini works hard to avoid this common adhesion problem through the use of automatic bed-leveling and other print bed technology. The upper surface of the Lulzbot Mini print bed is coated with PEI. The lower surface has a resistive heating element. The glass print bed is suspended above an aluminum structure by black Ninjaflex (a thermoplastic elastomer). Two other aspects of the print bed need to be covered: The print bed is heated and the glass print bed is covered with Polyethylenimine (PEI). Both are important if you want to maximize print bed adhesion. We’ve found that the PEI helps to keep parts of all material types and sizes stuck down (including HIPS, ABS, PLA, and TGlase -- which adheres VERY well). We’ve had success printing parts of all sizes, though we typically include a brim on tall narrow parts. It’s important to note that we expect this PEI layer to wear down at some point and we’ll need to replace it. Anyone have any idea how long the layer of PEI is expected to last? Should we try to print on lesser-used edges of the print bed for longevity? Lulzbot Mini extruder cleaning routine (before the bed-leveling routine). The Mini’s nozzle-cleaning routine is one of its more noticeable features. Its purpose is to rid the nozzle of any rogue plastic bits which would otherwise interfere with the Mini’s bed-leveling routine. Remember that this routine involves touching the business end of the extruder to four washers on the print bed. Any plastic that gets in the way could prevent an electrical contact and interfere with calibration. The Mini ships with a number of replacement felt pads used for cleaning (the grey strip in the above gif). The good news is that they are double-sided. The bad news is that we seem to go through them faster than expected … something to the tune of one pad each month with heavy printing. The cleaning routine, like the bed-leveling routine, is pre-programmed into “Start Gcode.” Slicers append this Gcode to the beginning of the Gcode which describes the toolpath for the actual part you plan to print. 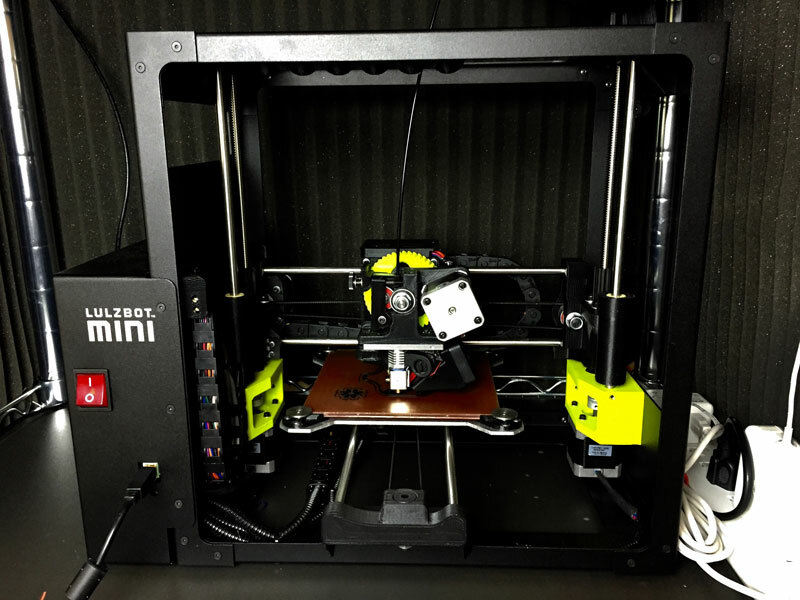 It’s important to note that the Mini is a simple 3D printer that requires a host to control its movements. For the uninitiated, this means that some printers are priced higher because they contain an internal print controller. The Mini is not one of these machines. It requires a dedicated controller (something like a Pi running Octoprint or any other computer with a USB). The Lulzbot Edition of Cura is open source. 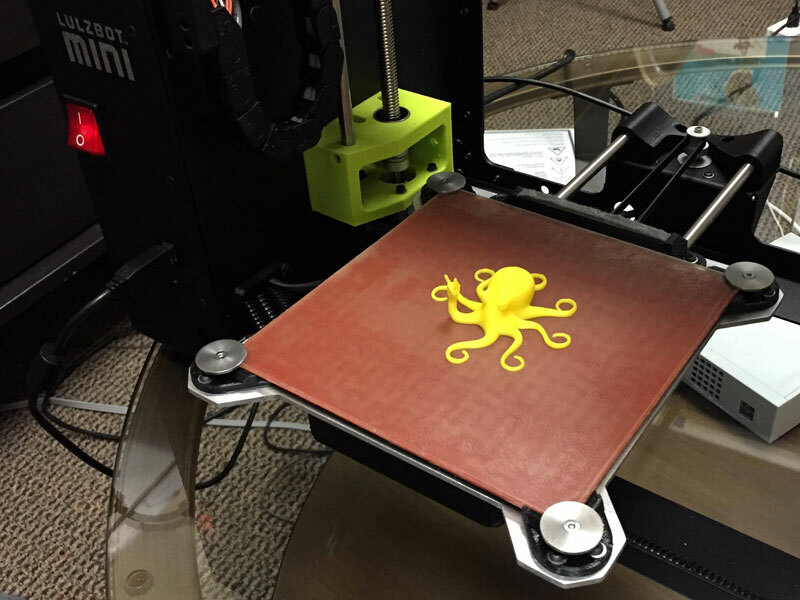 The company behind the Lulzbot line of products, Aleph Objects, Inc., is a strong proponent of open source software solutions. In fact, this is a huge understatement. I’ve heard rumors that every workstation at Aleph Objects, Inc. runs Linux and only open source software distributions. From their website (Drupal) to the machines they sell (the Mini’s design and assembly instructions are open source), there is a commitment to transparency and openness. Cura, the slicing software that ships with the Mini, is no exception. Cura comes from the folks at Ultimaker. 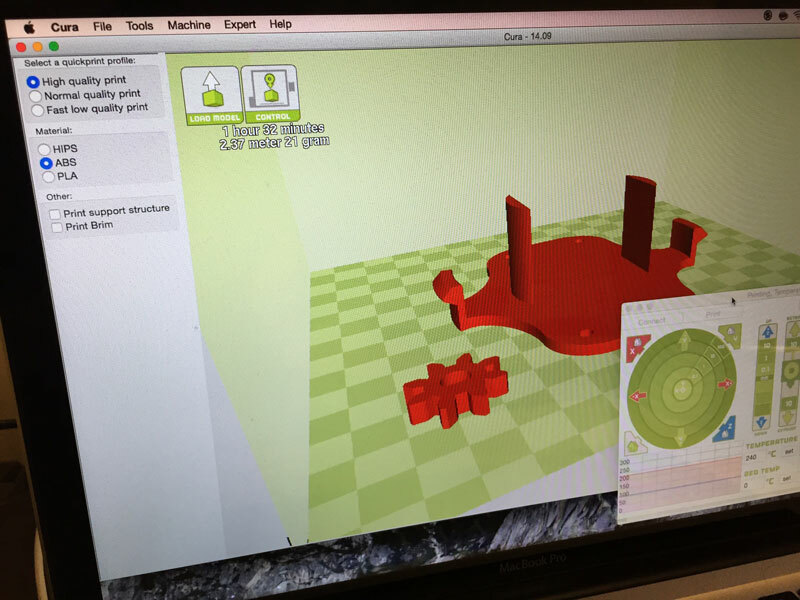 The Lulzbot edition of Cura includes a print controller, as well as a few quick-print profiles for getting started. We were up and rocking in no time. 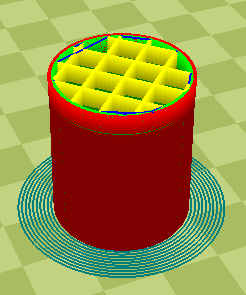 While the Lulzbot edition of Cura does work, it doesn’t always work well. We’ve needed to wrestle with it a bit, especially when we get to the “Control > Print” phase on Macs. We ultimately switched to Simplify 3D for more granular control; but, you’ll likely find Cura is satisfactory. One last thought on slicers. It’s fine to use the quick-print profiles included in Cura if your goal is to print random objects from Thingiverse. However, if you are interested in regularly printing items with critical dimensions, then you’ll want to break into Cura’s expert settings. This will provide you with full control over variables such as filament diameter -- a critical variable that slicers compute against when determining filament feed rates. 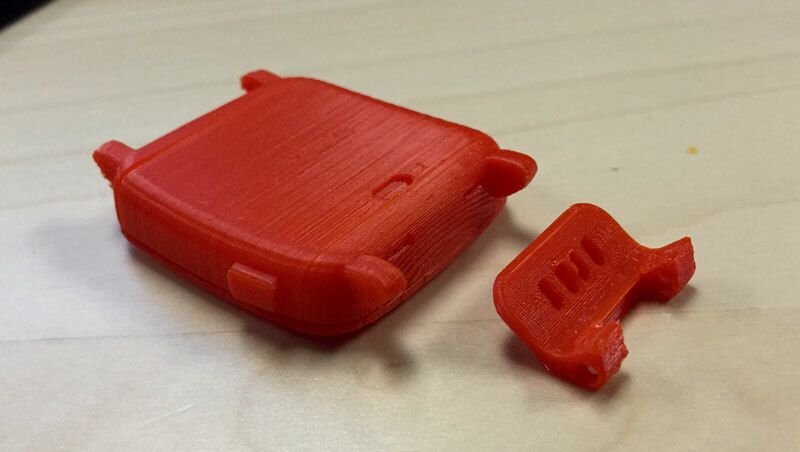 Printed on our Lulzbot Mini - the Pebble Time and smart strap connector (from the official Pebble GitHub repo). The Mini is a great printer with specific features that appealed to us at Viget. From the beginning, we prioritized reliability (it lives in a strong aluminum frame), ease of use (auto-calibration routines), and accuracy (.1mm x/y). The Mini excels in each of these areas without making significant compromises in others ... such as price ($1,350 MSRP). The Mini is a perfect fit for us at Viget (at least for now); however that doesn't mean the Mini is perfect for you. There are many options on the market and I encourage you to shop and compare. Give yourself some time, figure out what metrics are important, and timebox this search. If you have questions about the Mini, or about 3D printing in general, please don’t hesitate to bring them up in the comments below.